There’s not much we don’t know about sail eyelets – after all, we invented them back in the days when sail power transported British manufactured goods around the world. Nowadays our sail eyelets are used on pleasure craft more than tea clippers, but our range of sail eyelets is still the widest available. As well as high quality, British standard sail eyelets, we also manufacture wire cable thimbles in brass and stainless steel. Our sail eyelets and cable thimbles can be seen on vessels large and small, at moorings and marinas throughout the world. 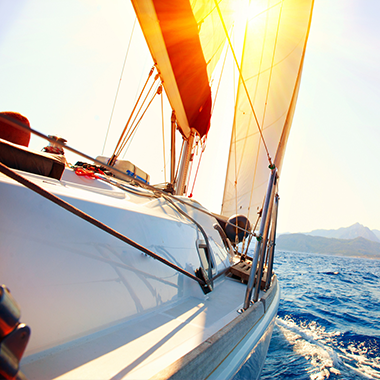 Our eyelets, rings, grommets, spur tooth washers, and wire rope cable thimbles are used throughout the marine industry for sails, boat covers and inflatables. Our high-quality, robust wire rope cable thimbles are available in stainless steel and brass finishes, and manufactured to last. Bodill Parker’s sail eyelets are manufactured and produced to BS3102, while our thimbles are produced to BS3226 British quality standards. Our thimbles are used in rigging, harnesses and safety equipment around the world, to secure cables throughout the marine, construction and transport industries. We manufacture cable thimbles in a range of standard sizes, as well as bespoke, custom sizes made to order.